The purpose of the qualification is for the learner to attain knowledge and practical competencies required to deal with a range of workplace first aid solutions. The TQUK Level 3 Award in First Aid at Work (RQF) isÂ at learners already working or preparing to work in industry. The qualification is usually delivered as a three-day programme of training and assessment for learners to allow them to be first aiders in the workplace. 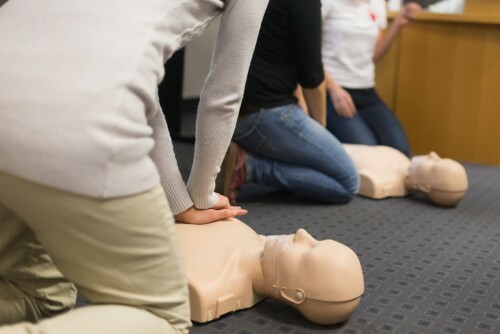 Our experienced trainers will take you and your colleagues through the awarding body assessment criteria, so you can be safe in the knowledge that your business will meet the legal requirements for first aid training. The Level 3 Award in First Aid at Work is designed for large or high risk working environments. We will also tailor it to be relevant to your specific work place so that you get the best training for your needs. 3 FULL DAYS (MINIMUM OF 18 HOURS OF TEACHING – EXCLUDING BREAKS AND EXTRA PRACTICE). Please note – HSE recommends that all trainees take yearly refresher courses to update their knowledge and assist in retention of skills. All students are awarded a recognised First Aid Certificate* which is valid for 3 years. You will also receive a first aid manual.